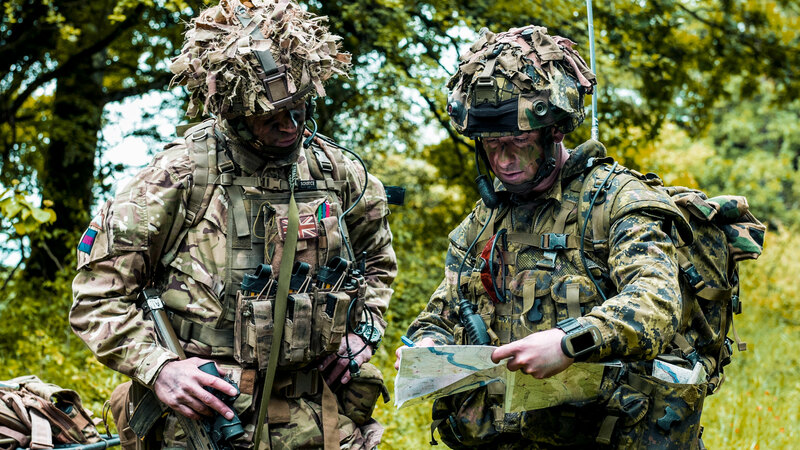 Land Task Force Commander Major Mark Lee consults with a British commander during NATO’s Operation Reassurance exercise in Romania in 2015. Canada has reaffirmed its support for the North Atlantic Treaty Organization (NATO) while the European Union weighs its limited options after United States President Donald Trump launched double-barreled criticisms of both the 69-year-old military alliance and the EU. In a recent column for the National Post, Minister of National Defence Harjit Sajjan reaffirmed previously announced plans to increase defence spending by 70 per cent over 10 years. He also touted intentions to shore up Canada’s NATO undertakings. “Canada’s commitment to NATO is about much more than just dollars,” Sajjan wrote, citing decisions to renew its support for Europe’s forward defence for another four years, boost its Latvian presence by almost 20 per cent to 540 troops, and take command of a new NATO training mission in Iraq. The EU, meanwhile, is re-evaluating its reliance on the United States after the president took NATO’s recent summit in Brussels by storm, calling its members “delinquent” in their defence spending and targeting German dependence on Russian natural gas, accusing it of being “totally controlled by” and “a captive of” Russia. He’s also called the EU a “foe” of the U.S. The Los Angeles Times reported recently that while European governments are rethinking their reliance on the U.S. as a strategic ally against Russia, they are unlikely to make regional security arrangements independent of Washington. But analysts are almost uniform in their conclusion that Europe’s defence alternatives are limited. At the July 12 summit in Brussels, Trump joined other leaders in condemning Russia’s annexation of Crimea and reaffirming NATO’s bedrock mutual defence provision that states an “attack against one ally will be regarded as an attack against us all.” The U.S. has also continued to deploy regular rotations of troops to Central Europe, where NATO is reinforcing its defences. Trump is not the first U.S. leader to criticize the contributions of other NATO members. Every president since John F. Kennedy—Republican and Democrat alike—has urged NATO countries to do more in their own defence, analyst John Ubaldi wrote for the In Homeland Security newsletter. Trump’s criticisms still have unnerved the alliance, the Times reported, “fracturing its cohesion and its confidence,” especially given his praise for Russian President Vladimir Putin. Analysts have said doubts exist within NATO that Trump would even join in an Article 5 action if it had no direct bearing on Americans at home. If he were to decline to deploy U.S. troops on NATO’s behalf, Putin may well be emboldened to further test the alliance’s resolve. It already has been tested. Russia annexed Crimea in 2014 and sent troops and supplies to aid separatist forces in Ukraine, where more than 11,000 Ukrainian soldiers and civilians have been killed and over 1.6 million citizens displaced. NATO subsequently deployed forces in four Baltic states to discourage further encroachments by Russia, the Canadian-led mission in Latvia among them. The EU has considered a military force independent of NATO for decades but has never acted on it. Some officials have discussed a European-only nuclear weapons capability, building on the small French stockpile of warheads outside NATO control, but that idea has not been developed either. “The EU itself faces existential problems, from the financial and institutional to the demographic and political,” wrote Bugajski. “In a potentially unstable and fracturing continent, NATO is the sole remaining institution that upholds international security. And it may become the sole multinational organization that can provide Europe with a measure of coherence. 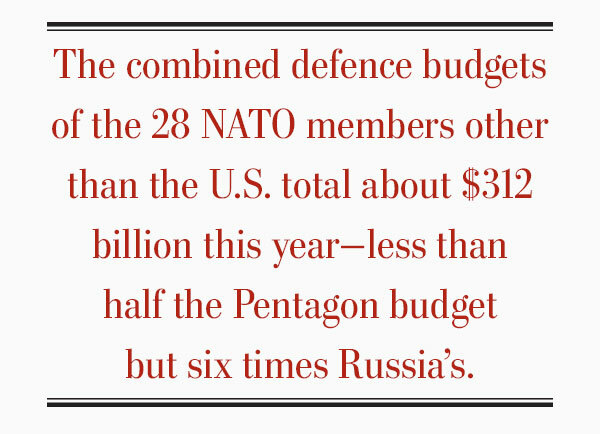 The combined defence budgets of the 28 NATO members other than the U.S. total about $312 billion this year—less than half the Pentagon budget but six times Russia’s. When contrasted with NATO states, Russia’s declining population and weak economy—roughly a $1.5-trillion GDP and fewer than 150 million people versus a combined NATO total of $40 trillion with 900 million people—have been cited as contributing to an embittered and paranoid mentality in Moscow. Some NATO members privately admit that compliance with the alliance’s two per cent defence spending target is their only viable option, said Alexander Vershbow, a former U.S. ambassador to Russia and NATO’s deputy secretary-general from 2012 to 2016.